Former Worldcom boss Bernard Ebbers has reported to a prison in Louisiana to start his 25-year jail sentence. Driving through the gates, Mr Ebbers pulled his hat down low to try and shield his face from reporters. Ebbers was convicted of fraud and conspiracy for his role in an $11bn (£5.8bn) accounting scandal that led to the collapse of Worldcom in 2002. The earliest date at which Ebbers will be released is 2028, by which time he will be over 85 years old. He has reported to the medium-security Federal Correctional Institution in Oakdale, Louisiana. The former Worldcom boss was originally sentenced in March 2005 but had subsequently appealed against the decision. 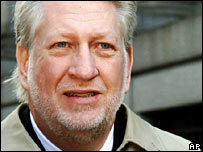 A federal appeals court in New York upheld the guilty verdict in July 2006 after a judge found that personal gain had been the main motivating factor behind Ebbers' actions. Prosecutors said that Ebbers co-operated in a scheme to falsely boost the value of the company's shares by hiding the true state of the firm's finances. During the technology boom of the 1990s, Ebbers was a star of corporate America as Worldcom's standing went from strength to strength. But when Worldcom collapsed it was the biggest corporate bankruptcy the US had seen. When the firm filed for bankruptcy protection, some 20,000 employees lost their jobs and shareholders lost about $180bn. Ebbers left the firm in 2002 after admitting borrowing money from Worldcom to cover losses he incurred in buying its shares.